I had about 1 minute to decide what to do, and I decided to go back and see if I could get on another boat in stead. When I got back in to the terminal, I was approached by some of the security guards, they quickly sorted it out, and they came back with my money from the ticket, and told me to go buy a new ticket, to Puerto Galera this time. I got my new ticket and we now had to wait for another hour or so on the next ferry to Puerto Galera. 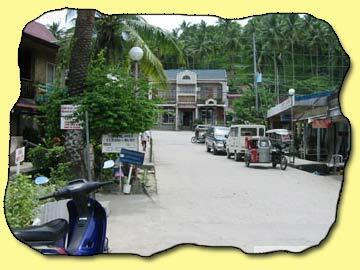 We arrived in Puerto Galera at around 5-6pm; there are about 6 km. From Puerto Galera to Sabang beach, so we needed to find out how to get there, that in itself wasn't difficult, because there were a dozen or so trike drivers yelling at us, for us to let them take us to Sabang, going rate right at the dock was 300 peso at the time. We wandered off towards the main road, and asked a trike driver there in stead, and he agreed to take us to Sabang for 150 pesos. Still an expensive 6km. But I didn't want any more hassle, and I couldn't be bothered arguing over a few more pesos. Finally we got to the Tropicana, and we were greeted by the owner Paul, a very friendly person and. His wife Ellen has made most of the wall decorations in cross-stitches; it must have taken her forever hehe. We went upstairs to our room, and were marvelled by the fantastic view here. I was however disappointed that the "private patio, with hammock", was a public patio with hammock, just placed right outside the windows of the penthouse suite, so we had to keep the curtains closed all the time we were in the room, kind of defeats the purpose of getting a penthouse suite, I wanted it because of the privacy and the view. 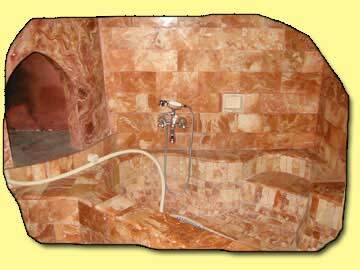 The room itself was beautiful, the bathroom was all in marble, and it had a large bathtub and two showers, the main room had two king size beds, the promised 27" TV, was degraded to a regular 14", the big one just broke down, oh well, we didn't go there to watch TV anyway. All in all a very stylish and very big room. We quickly ordered some food from room service, as we were very hungry after the long trip, hadn't had anything since the burgers at McDo in the morning. The food at the Tropicana is very good; they have a good mix of Filipino and European dishes. After the meal, we changed to the swimwear, and got ready for a night dip in the pool, they have a great pool here. In the pool area, we met our neighbours, a nice guy from Norway, and his likewise nice filipina wife, so we had a few beers with them and talked about what Sabang had to offer. We talked about renting a boat, and going on a boat ride one of the next days. We had a good time and time flew, and the fatigue from the trip caught up with us, so we went off for the day. I didn't feel well the next day, so we stayed in and around the hotel, wit ha few dips in the pool, and a quick trip down to the market street, Sabang has a long street, with small souvenir shops, restaurants and bars, very nice area for a walk, and the hassle level is surprisingly low. A whole day went on, where we just relaxed and enjoyed being in Puerto Galera.